Temecula Valley Wine Country is the setting to more than 4,000 weddings each year. Not only is it conveniently located in close proximity to San Diego, Orange County and Los Angeles, but it’s also uniquely noted for its sunny and year-round mild climate. 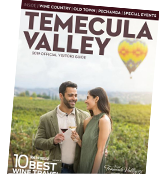 Temecula Valley is a premiere wedding destination offering unique venues from intimate barrel rooms and grand ballrooms, to breathtaking vineyards and farm style settings; the variety of locations to exchange wedding vows and celebrate that special day is endless. For more information on venues and hotel room blocks, please call 888.363.2852.